Chris Molinari (M.Ed. Clinical Mental Health Counseling 2017, B.M. Music Performance 2014) is a guitarist, composer, yoga instructor. 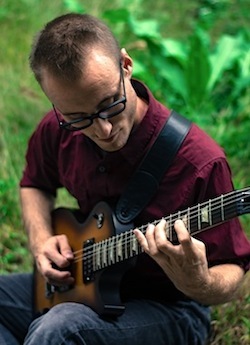 His latest music release, Electric Yoga Class uses the electric guitar as the primary instrument in forming ambient and post-rock soundscapes. It is regularly used by yoga instructors for their classes and has an international listenership. His upcoming release, Ramayana EP, is a cinematic dark ambient aural collage depicting scenes from one of the world's oldest and longest epic poems, the Ramayana. Chris regularly uses his guitar and other instruments live in his own yoga classes, and serves as a live instrumentalist for other yoga instructors. In May 2017, he led a three-day retreat at the Himalayan Institute called The Simple Path to Peace that brought together yoga, systematic relaxation, meditation, and other practices.